In case you didn’t know, the Sprint and Verizon iPhone 4S models are capable of running on GSM networks such as T-Mobile or Vodafone even though Verizon and Sprint are CDMA carriers. This is because the iPhone 4S for Sprint and Verizon is a world phone, is has multiple frequencies including CDMA and GSM. Unlike AT&T who won’t unlock any of the iPhone models if you ask them, Sprint and Verizon will unlock it if you request it. 1. If your iPhone 4S is running on Verizon’s network you can unlock it. Before unlocking any world phones, Verizon customers have to meet the requirements below, according to Verizon support team. Must be a Verizon Wireless customer. The device being unlocked must be active on a Verizon Wireless line of service. The line of service must be active at least 60 days. The line of service must be in good standing for the past 60 days. Only one SIM Unlock per line every 10 months. The customer’s manufacturer’s device warranty is not affected by a SIM unlock as long as the customer remains with Verizon Wireless. If you don’t meet all of those requirements try it anyway, they might still assist you and unlock the iPhone 4S. 2. Now you will need a foreign micro SIM card; AT&T or T-Mobile USA SIM cards won’t work. If you own a normal foreign SIM card, not a micro SIM, you can cut it to the size of a micro SIM card. Search videos on YouTube if you need help cutting a normal SIM to make it a micro SIM. Then insert the foreign SIM card into the device. Some people are reporting that to get the Verizon iPhone 4S unlocked, all you have to do is insert a foreign SIM card and connect to iTunes and the phone will get unlocked by itself. If that doesn’t work for you, continue with the next step. 3. Once you have all the above ready, call Verizon Global Support at 1-800-711-8300 and ask the representative for a SIM unlock. If you get a representative that doesn’t know what you’re talking about or tell you that they can’t unlock the iPhone, don’t them transfer you to a different department. This is the right department that deal with unlocking world phones. 3. The rep will confirm you that the unlock has been applied to your account and check the phone to see if is working with the SIM card, it should roam on AT&T if you’re in USA. Sprint still haven’t said much about unlocking iPhone other than ‘customers in good standing‘ can request unlock for their iPhone 4S. I haven’t personally heard or seen a Sprint customers that has successfully unlocked the SIM slot on their iPhone 4S. Though people on the Sprint and Sprint User forums have reported that their iPhone 4S has gotten unlocked by just inserting a foreign SIM card. Another user said on the Sprint forum that he called customer service to get the phone unlocked and the representative said that they still haven’t received the unlock codes for iPhones, but they expect to have it by November 11. AT&T is the only iPhone carrier in the US that doesn’t offer unlock for iPhone. AT&T iPhone users will need to use third party software and hardware such as Gevey SIM from applenberry or ultrasnow from the iPhone Dev-Team. If you have any additional information or personal experience unlocking the iPhone 4S, please let us know in a comment below. 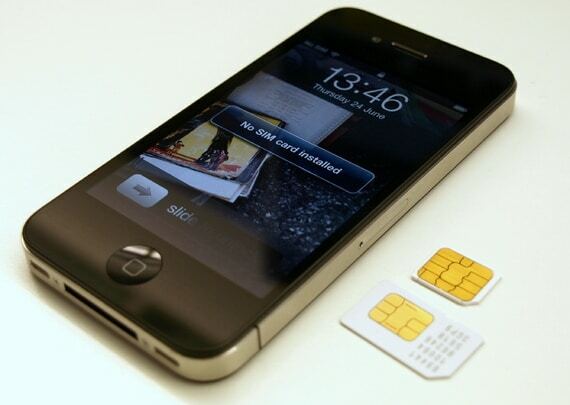 The AT&T (GSM) iPhone 4S can now be unlocked using new unlocking solution such as the Gevey SIM and TPSIM.